Comments: T, Cassie, and Gwen have a fun to read chit-chat. The art looks great and when the football game is on even better. The action on the field is drawn showing them going fast and hard. 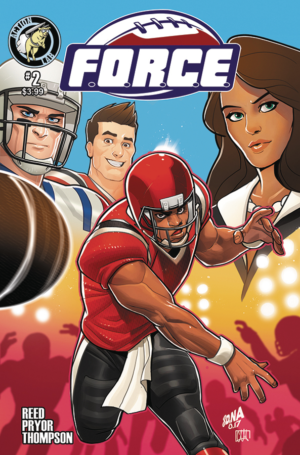 This comic shops you what happens off the field with T a football player. We see that not all football players go by the rules. T gets hit hard on his injured leg. It is treated as part of the game but you see that it is a man’s life as well. “Ebonee Lifestyles In Color” Ebonee Cover Artwork by Jay Reed, Ebonee Cover Layout/Design by Shawn Pryor, Article Artwork by Marcus Kwame Anderson, Advertisement Artwork by George Gant and Written by Shawn Pryor. Cassandra Knox is an Executive in the F.O.R.C.E. Football League. She is a woman who drives herself to excel. If you’re interested in football on and off the field your sure to enjoy this.